Nonprofit organizations are often focused on how to bring in the next donation. But in order to sustain your impact for the long haul, you have to move beyond the hand-to-mouth mindset. You need to think ahead—years ahead. How are you preparing for the next generation of donors? While young donors might not have as much giving power right now, they represent the future of philanthropy. By pulling them into your mission early on, your organization can stay top of mind as their income increases in the coming years. Here are four ways you can cultivate donors for the next decade. Mobile devices are quickly becoming the primary way people access the internet, and your nonprofit’s online presence must keep step. Google now officially boosts the ranking of mobile-friendly pages to give users a better online experience. The majority of emails (66 percent) are also now being read on a mobile device. These trends will only persist into the future, and they present a huge wake-up call to all nonprofits: your website and communications need to be mobile-friendly. More importantly, tomorrow’s donors—young, tech-savvy Millennials—are the heaviest mobile-device users. According to the 2013 Millennial Impact Report, 80 percent of surveyed Millennials read articles and emails from nonprofits on their phones. Eighty percent also prefer nonprofit websites that are mobile-optimized. If they want to secure this generation’s support, nonprofits must adapt to their new audience’s preferences. Use responsive design to make sure your website and emails adapt to all screen sizes. 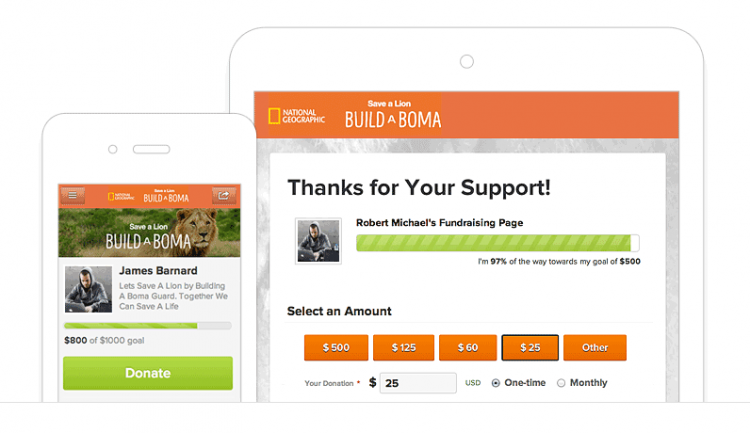 Your website and donation checkout page, especially, should be mobile-ready so supporters can easily make a gift on their smartphones or tablets. As Classy’s responsive donation pages demonstrate below, your checkout page should format properly across devices. Make sure your emails are mobile-friendly as well. Lots of email marketing services, like MailChimp, provide responsive templates along with their distribution tools. Others allow you to import them. In the meantime, you can check out this collection of 30 free responsive email templates. While lots of young supporters can’t make large one-time gifts now, many are open to becoming monthly donors. According to the 2013 Millennial Impact Report, 52 percent of respondents expressed an interest in monthly giving. Given the immense lifetime value of recurring donors, this presents a huge opportunity for nonprofits. A very small monthly gift adds up over the course of a year, and it can even lead to higher annual giving levels. More importantly, it also boosts your chances of keeping the donor. Recurring donors have a much higher retention rate across years, up to 70 to 80 percent. Also keep in mind that an individual’s income will likely increase over the next decade, allowing many young donors to increase the size of their monthly gift. All in all, a small monthly gift can help you bring in more revenue each year and keep a donor for the long term. Experiment now with asking donors to make small monthly gifts. Even a $10 monthly donation can add up to thousands in donor lifetime revenue. To set the stage for future donations, it’s a good idea to ask supporters to donate their time first. Volunteers are almost twice as likely to donate to a nonprofit as those that don’t volunteer. In addition, those who give their time can also become much more generous with their donations. A survey by the Fidelity Charitable Gift Fund found that people who volunteered in the last year had donated ten times as much money as those who hadn’t volunteered. Two-thirds had donated to the same organization at which they volunteered. To engage the younger generation, focus on bringing in volunteers. Match them with tasks that fit their skills and follow up with them for feedback. Show them you are striving to deliver a meaningful experience. By building strong, lasting relationships with them now, you can stay top of mind when these supporters are in a position to give. When looking to secure support across generations, try looking at the younger members within the family unit. Encourage supporters to bring their children and other relatives to your family-friendly fundraisers. This allows you to gain early access these younger generations. When your cause is a regular part of a young person’s upbringing, they may think of you later when they are ready to give. Let’s consider a hypothetical example. Sarah is a twelve-year-old in middle school. Every year since she was young, her entire family has participated in AwesomeOrg’s annual 5K. Because this event is a family tradition, she’ll continue to attend and support the organization for years to come. By the time she’s 22, she has not only donated several times out of her own pocket, but also fundraised on behalf of the cause. Giving rooted in family tradition offers a great opportunity for your nonprofit. If you’re not already doing so, incorporate family-friendly events into your calendar to promote generational giving. Preparation is key to fundraising success—especially when it’s for years ahead. Whether you update your website for mobile screens, or ramp up your volunteer recruitment efforts, the steps you take today can nurture donations for years to come.